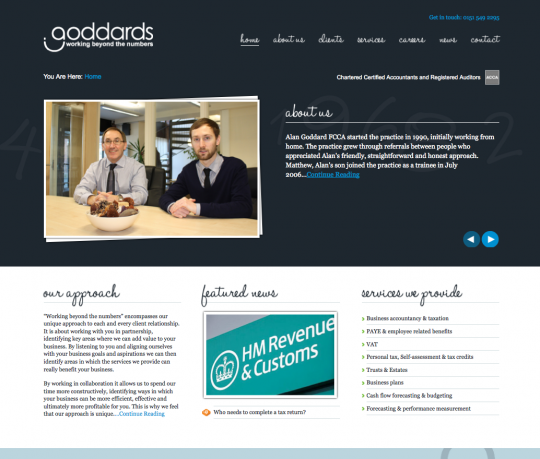 3, 2, 1… the launch of www.goddardsaccountants.co.uk is here. The igoo design team have been working alongside father and son partnership Alan and Matthew Goddard to create the perfect online home for their accountancy company, Goddards Accountants. Goddards is a family run company offering a full range of services for businesses and individuals. Started in 1990, the company has gone from strength to strength and now runs from offices on Ormskirk Road in Knowsley Village. With integrated seo, igoo has used Goddards existing brand to create a fresh new web presence for the company, making it easier than ever for clients to locate, contact and utilize their services.